1. 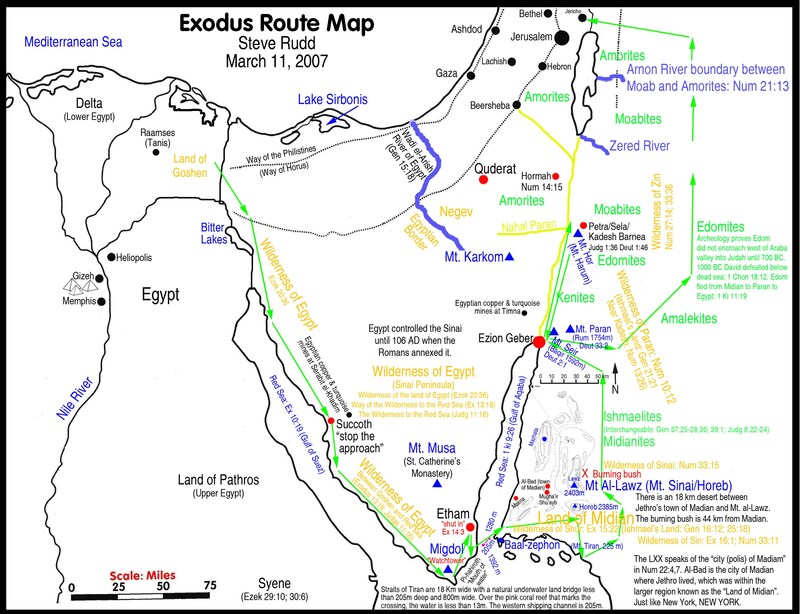 The Passover in Egypt was 1513Nisan14. Cakes was 1513Nisan15-21. They reached Succoth (Booths) on 1513Nisan22 and held an assembly there. Then they walked 150km to Pihahiroth (meaning Bum of the Sheik). But a better metaphor would be cervix of Israel, the Apex of the Sinai peninsular. Then they carried on to Etham. Then they came back to Pihahiroth again. Then they camped there in Booths for 7 days presumably to give Pharaoh enough time to hear about there turning back upon themselves and collect his chariots and chase after them and reach them. 43 in order that your generations may know that it was in the booths that I made the sons of Israel to dwell when I was bringing them out of the land of Egypt. I am Jehovah your God (Leviticus 23). The pillar of cloud by day and the pillar of fire by night appeared after they left Egypt. These 2 pillars stand for the correct 2nd and 3rd fire sign predictions. For the Jews were not misled by the pillars. They were led by them! The LWs have been misled by false pillars for nearly 12 years. But no more. Now what does a pillar do? It holds up a church. And how many pillars were there at the door to the temple? TWO. The Exodus of God's people from Watchtower slavery is a third Exodus to the one from Egypt and the one from the Roman Catholic church in the first presence. So it occurs at the 3rd Passover/Cakes which runs from 2019Sivan14-21, which is the Zoar Passover/Cakes. They are coming into Zoar after all. We saw/published 2018Tammuz7/8 for the 2nd fire sign and 2018Tammuz10 for the 3rd fire sign on 2018Sivan30/2018Tammuz2. We saw/published 2018Tammuz10 for the 2nd fire sign and 2018Tammuz10 for the 3rd fire sign on 2018Tammuz9. We saw/published 2018Tammuz21 for the 2nd fire sign and 2018Tammuz24 for the 3rd fire sign on 2018Tammuz10-11/12. We saw and published 2018Tammuz24 for the 2nd fire sign and 2018Tammuz24 for the 3rd fire sign on 2018Tammuz10-22/22. We saw and published 2018Tammuz30 for the 2nd fire sign and 2018Ab4/5 for the 3rd fire sign on 2018Tammuz25. We saw and published 2018Ab4/5 and 2018Ab4/5/6 for the 2nd fire sign and 3rd fire signs on 2018Ab1. We saw/published 2018Ab8 and 2018Ab8 for the 2nd fire sign and 3rd fire signs on 2018Ab6/7. We saw/published 2018Ab19 and 2018Ab19 for the 2nd fire sign and 3rd fire signs on 2018Ab9. We saw/published 2018Ab29 and 2018Ab19/2018Elul5 for the 2nd and 3rd fire signs on 2018Ab20. We saw/published 2018Elul1/2 and 2018Elul5 for the 2nd and 3rd fire signs on 2018Ab30. We saw/published 2018Elul4 and 2018Elul4/5 for the 2nd and 3rd fire signs on 2018Ab30. We saw/published 2018Elul10 and 2018Elul11 for the 2nd and 3rd fire signs on 2018Elul6/7. We saw/published 2018Elul14 and 2018Elul14 for the 2nd and 3rd fire signs on 2018Elul12. We saw/published 2018Elul14 and 2018Elul24/25 for the 2nd and 3rd fire signs on 2018Elul13. We saw/published 2018Elul24 and 2018Elul24/25 for the 2nd and 3rd fire signs on 2018Elul15. We saw/published 2018Tishri5 and 2018Tishri5 for the 2nd and 3rd fire signs on 2018Elul25. We saw/published 2019Elul5 and 2019Elul5 for the 2nd and 3rd fire signs on 2018Tishri9. We follow the 2nd fire sign (the pillar of cloud - a fire sign which occurs in the day, or the pillar of fire - a fire sign which occurs during the night, or the pillar of fire and cloud - a fire sign which occurs at sunset or at sunrise) until it has passed, Then we follow the 3rd fire sign (at sunrise) until it has passed. Night is literal in the accounts of Exodus 13 and Exodus 14. But in Hebrew the word actually means a turning around (not night). So the period of turning around (the metaphorical night) occurs perhaps between the 2nd and 3rd fire signs. Whereas the metaphorical day dawns with the 3rd fire sign. For in Hebrew thinking the night precedes the day. After they turned around to go back to Pihahiroth and once they saw the Egyptian chariots coming for them, then the cloud departed from leading them and went behind them and came in between the camp of the Egyptians and the camp of Israel, to protect the Jews. The pillar of cloud (and fire) moving from leading to following and protecting is the occurrence of the 2nd fire sign at sunset. So there it is. A mapping of 1513Nisan14-1513Iyyar10 on to 2019Sivan14-2019Tammuz10 for the Bethels and on to 2019Tammuz14-2019Ab10 for the congregations and on to 2019Ab14-2019Elul10 for the whole 1NC reserve temple. Laodicea can not hold the 2019Nisan14 or the 2019Iyyar14 Passover because id they did that, there would then be a 2019Nisan21 or a 2019Iyyar20 marriage in the ark. But 1NC reserves cannot get married in Nisan or Iyyar because they are the 3rd marital appointment of the 1NC (not the 1st or the 2nd). So they should get married at the 3rd 1NC first fruits day (if there is one). So they must be appointed at the 3rd 1NC first fruits festival which exists this year due to the Watchtower Passovers. And indeed they must be appointed in Sivan because they are the 3rd appointment. So there is to be a 2019Iyyar13/Sivan14 1st Watchtower Passover with 1NC reserves present. But Laodicea holds that not Zoar. The same is true of 2019Tammuz14 and 2019Ab14, because the Passover of Israel occurred in Egypt. And because the one group did not come near the other group all night long, which night is the Passover night. There are the 6 stages of the heavenly locust. 5 instars followed by the adult stage. The instars are the 5 marriages, during which the 1NC body of the 3rd Holy Spirit grows one step. Then at the 5th marriage Pentecost they can fly around and eat up all the food from the field. 15 Even there fire will devour you. A sword will cut you off. It will devour you like the locust species. Make yourself heavy in numbers like the locust species; make yourself heavy in numbers like the locust. 16 You have multiplied your tradesmen more than the stars of the heavens. As for the locust species, it actually strips off its skin; then it flies away. 17 Your guardsmen are like the locust, and your recruiting officers like the locust swarm. They are camping in the stone pens in a cold day. The sun itself has but to shine forth, and away they certainly flee; and their place is really unknown where they are. (Nahum 3 NWT). 14 I am not able, I by myself, to carry all this people, because they are too heavy for me. (Numbers 11 NWT) - this is the only incidence of the word 'heavy' in the book of Numbers. God then went on to tell Moses he would give him meat for 30 days and he should appoint 70 elders to help him. FDS4 was cut in two on 2003Heshvan21, by the installation of Laodicea to feed the 1NC reserves. Our 6,000 solar day 2NC working week to fix that disaster runs from then until 2020Nisan29/30, the end of the Laodicean Iyyar1 secular year. Then we have the 1,000 day secular Sabbath to 2022Tebbeth21, when we are installed as Caesar to the Kingdom. FDS3 lost its water baptism on 2001Heshvan14. Their 6,000 BLC day 1NC working week to fix that disaster runs from then until 2001Heshvan14 to 2019Elul5 (the 2nd and 3rd fire signs), with the 1 year and 51 day Zoar 1NC installation gap from 2012Sivan14 to 2013Ab5. Then 1,000 day sacred Sabbath ruling with the Christ from 2019Heshvan10? The Watchtower lost its water baptism on 2001Heshvan14 as a result of the awful letter to the Bethels of 2001Heshvan10 following the Guardian expose on 2001October8 (2001Tishri16) of the Watchtower joining the UN as as NGO associated with the UN DPI which was riding the wild beast of Revelation13 as a harlot church and putting the throne of Satan in the temple of Jehovah. The Watchtower resigned from the UN on 2001October9 (2001Tishri17). 6000 whole solar day secular working week of the LWs from 2003Heshvan21 (the installation of Laodicea to feed the 1NC reserves, our cutting in two) to 2020Nisan29/30. 6000 whole solar day sacred working week of the LWs from 2003Heshvan10 (late Atonement day) to 2020Nisan18 (1NC first fruits). 1000 whole solar day secular Sabbath of the LWs from 2020Nisan30 to 2022Tebbeth21, when we are installed as the 3rd appointed Caesar to the Kingdom (after the dragon and the 3rd Holy Spirit). 1000 whole solar day sacred Sabbath of the LWs from 2020Nisan18 (1NC first fruits) to 2022Tebbeth9. 1000 whole solar days of 1NCs ruling with the Christ as our Caesar from 2020Nisan30 to 2022Tebbeth21. Then the ark leaves and we rule alone (physically) from 2022Tebbeth21, the late late 2NC Pentecost, our installation 3rd to the 3rd Holy Spirit and to the dragon over the Kingdom, due to the penalty for the waters of Meribah on Moses. David (1NCs) and Solomon (2NCs) are coregent for 1,000 days. 3. On 2013Iyyar5 at sunset there was a fertilizer explosion upon the town of West in Texas. This fulfilled Luke 12:54-56 by producing a cloud upon West at sunset. Then on 2013Ab5 the South wind was blowing from Zoar because we were installed to baptise the unsanctified non adamically at the Zoar Pentecost from 2013Sivan16 having missed the 2012 appointment dates of 2012Sivan16 and 2012Tammuz16 due to the Jubilee and the weekly Sabbath. 2013Ab5 completed our Zoar installations. In 2019 the South wind starts blowing on 2019Tishri10, the 5th marriage Pentecost, the completed 3rd Holy Spirit Pentecost. 2019Tammuz9, 3 months earlier, is the installation of Laodicea, which constitutes a rising cloud of spirit baptised Laodiceans. Also the Great Tribulation of Matthew24, begins on 2109Elul14, 7 months of heating up the fiery furnace of Daniel3 before 2020Nisan14, the start of the lava flood. So 3 months before the heat wave of the Great Tribulation is 2019Sivan14, the complete 1st Watchtower Passover when a rising cloud of true 1NC reserve is identified for the first time. They rise into the ark on 2019Sivan18 for the marriage. So 2019 is a 1½ month late rerun of 2013 for Luke 12 as well as being a 4 month late rerun of 1513 BC for Exodus 12-14. 43 And he said to his attendant: Go up now, look way of sea/West. And he went up and looked and said: there is not anything [1x+1x+1x+1x+0x=4x, then +7x=11x from 2011Heshvan2, when he went up, reaching the top on 2011Chislev21, to 2012Elul5 - a prediction no show festival Sabbath]. And he said Go back 7 times [from 2012Elul5 to 2019Elul5, the late Zoar Pentecost, the 2nd and 3rd fire signs. That is the count. But the symbolic meaning is that there was nothing on 2012Ab5, the first festival Sabbath no show after 2011Chislev21. Then the attendant goes back 7x to 2019Ab5. those being the 7 Sabbaths. Then the SuperPentecost is 2019Elul5]. Since Elijah put his faces between his knees, a sentence count is triggered - just for verse 42. 5. We now finally understand that all adamic Passovers must occur on Nisan14/Iyyar14 if they are single month affairs or must start on Nisan14/Iyyar14, if they are triple month affairs. But what about the lava flood? It is an execution of Adam and a Passover of Abraham - for I am a shield for you said Jehovah in Genesis15. So it too begins on Nisan14. The Watchtower Passover is actually a non adamic Passover by virtue of the 3EC. The blood on the door frame is the non adamic blood of the 3EC. It is a Zoar Passover. So it begins on 2019Iyyar14, but the first execution occurs on 2019Sivan14. Whereas the flood is an adamic execution in that only sons of the 1AC who are constructively Abrahamic, will survive it. So it must begin on Nisan14, this being the day upon which he was sentenced to die. Therefore the start of the 40+40 day lava flood is 2020Nisan14. Therefore the end of ark entrance is 2020Nisan7, 7 days of Genesis7, earlier. Therefore the start of ark entrance is 2019Sivan8, 300 days of the length of the ark earlier. 6. It is now the case that the attendant of 1Kings18 goes back for 7x from 2012Ab5 (the first Zoar Pentecost, the first no show prediction festival Sabbath after Elijah4 went to the top of Carmel on 2011Chislev21, the end of the LW 2NC Alienation Times from 2004Chislev21). So that takes him to 2019Ab5, 7 Zoar Pentecosts later. These 7 times look like some kind of Zoar Alienation Times? Zoar should have been kick started on 2012Ab5, instead it is kick started on 2019Elul5. For we go to the next divine Pentecost after 2019Ab5, which is the late Zoar Pentecost on 2019Elul5, for the 8th Sabbath, the SuperPentecost. And the 103rd Watchtower BLC Baalian Pentecost from 2005Iyyar14 is 2019Elul4. 15 'And you must count for yourselves from the day after the Sabbath [first fruits, an annual festival day], from the day of your bringing the sheaf of the wave offering, 7 Sabbaths. They should prove to be complete. 16 To the day after the 7th Sabbath [Pentecost, an annual festival day] you should count, 50 days, and you must present a new grain offering to Jehovah. (Leviticus 23 NWT). 7. The beautiful Daniel12 interpretation of 3x (1x+ 1335x)= 4008x days. 12 Oh the happinesses/blessings of the one who is keeping in expectation and who reaches to the 1,335 days! The Kingdom of God and its expectation began in on 2008Nisan22 (the 1st marriage). We have been in expectation of its manifestation since then (actually since 2008Nisan14). If we add 4008 days to 2008Nisan22 then we get 2019Sivan10. Then on 2019Sivan11 the 3rd presence begins and Jesus joins the Laodicean church! Sentence count verse 11: 2x1290=2580 days from 2012Sivan14, the end of the constant feature (due to death to Adam) to 2019Ab14, the final Passover of the Watchtower, the end of the judgement on that church. 8. The Jericho (moon city) pattern is 6 years and 7 months as follows. Also 7 priests with 7 trumpets is a witness to a fundamental 7x in the Jericho campaign - Perhaps from our dying to Adam as Passover victims on 2012Sivan14 at the Zoar Passover, to 2019Sivan14, the 1st Watchtower Passover? In the Pentecostal or Jubilaic monthly pattern for the Watchtower, the Jubilee or Pentecost release day would be 10th day of that 8th month of the 7th year, which is effectively the '50th month' (being the month following a count of 7 months during a Sabbath year, i,e, 7 Sabbath months, rather than following 7 Sabbaths of months, i.e. 7 sevens of months. Here, we are taking the word 'Sabbath' to mean the ordinal number 7th rather than the cardinal number 7. 9. Jesus is betrayed into the hands of sinners. That is an official 20 Passover betrayal from 1999Nisan14/Iyyar14 to 2018Nisan14/Iyyar14 and not to 2019Nisan14/Iyyar14/Sivan14/Tammuz14/Ab14,. Because the Watchtower Passover was rejected after 3 accountable denials of the Christ on 1996/1997/1998Nisan14/Iyyar14. The fell over the saints on 1998Elul27/29 and their Passover failed on 1999Nisan14. 10. The 12x of Abraham's Kingdom Possessing Times from 2008Nisan14, the end of ARC world 1AC entrance to 2020Nisan14 the start of Adam's execution - leaving the Kingdom for Abraham. 11. 35 Heaven and earth [of the world and of the Watchtower] will pass away/come beside/arrive, but my words will by no means pass away/come beside/arrive. 36 Concerning that day  and hour nobody has seen , neither the angels in heavens nor the Son, but only the Father, alone [monoV] [true when Jesus said it, not true after Jesus died - Nobody knows the date of their marriage until after they have proposed. But in fact Jesus proposed the ARC on 3993Nisan14, so he knew 2008Nisan14 then - unless he was given a lease of indeterminate length? Certainly after the last supper, after his proposal to his wife, he should then know the date of his marriage to that maiden]. So this scripture, rather than prohibiting advanced knowledge of the day and the hour, actually gives you the length of the hour as being a twelfth of the particular day. So the hour of the passing away of the heavens and the earth is one twelfth of the length of the day of the second presence which is 120 years. And on 911, 2016, the LWs first saw this (2016Tishri5 at 15:40). The day of the second presence runs for 120 years from 1889Sivan10 to 2001Heshvan10 and then from 2006Iyyar10/11-2013Chislev11. The hour of the passing away of the heavens and the earth is therefore 10 years long. It is the period when we have no presence from 2001Heshvan10 to 2006Iyyar10 and from 2013Chislev11 to 2019Sivan11. That is 4½ + 5½ = 10 years. AND: The day of the Watchtower existing as a false church is 15 years 3 months, 15¼ years, from 2005Iyyar14, to 2020Ab14, the end of the Watchtower as a true church (heavens) to the end of its congregation (its earth). AND: The hour of the passing away of the earth of Adam and of those who die sacrificially runs for 4 months from 2020Nisan14, the 1NC reserve sacrificing Passover (300 Denarii after 2019Sivan14), to the late 3rd Abrahamic Passover, the absolute end of Adam at midnight on 2020Ab14. Whereas the day of the passing away of the heavens of the dragon runs from 2016Sivan1, when the dragon was evicted from the heavens (or from 2016Iyyar14, when he was possibly passed over) tp 2020Iyyar14, which is the end of his heavenly authority (but not his earthly belligerence). That is 4 years. 10 Kings having 1 thought and 10 horns carrying out their one thought represents 10x, which must be either days or months. These must end on 2020Tammuz4, the last day of the flood, the end of the 10 kings. So they begin on 2019Elul4/5, the 2nd and 3rd fire signs. Actually there may be 10 days of having one thought from 2019Ab24/25 (when the dragon is let off his chain) to 2019Elul4/5 or from 2019Elul4/5 to 2019Elul14, the start of the Great Tribulation. 12. 7 months of heating up the fiery furnace of Daniel3 run from 2019Elul14 to 2020Nisan14, the start of the lava flood. So the 2nd and 3rd fire signs must occur on or before 2019Elul14. 14. WW3 lasts for 42 days, a bear tooth of Revelation7:5 for a day. It must end with the Mark becoming law on 2019Tishri16, which ids when peace (from WW3) and secularity (from nuclear oblivion) is declared. So it must begin on 2019Elul4/5. The 2nd and 3rd fire signs are the beginning of that war. So here we are truly at the Red Sea brothers. Now Frank has an amazing interpretation. The sons of Israel did not have to go into the sea in order to get out of Egyptian control..
That means that JWs do not have to enter into the world in order to get to Zoar. They can join Laodicea which is a sect within the Watchtower and is a dry land, having no water baptism and being a true church. Then they can come to us via that route. So it appears that Laodicea, having been the means by which the Watchtower prevented JWs joining this church for 16 years is now going to become the bridge which enables witnesses to join the LWs without having to venture out into the ghastly old world out there. God is really making it easy for them!